Offsoon Mark II endface cleaning machine is a type of cleaning equipment with high performance and low cost. The Mark II has been improved according to feedback from the customers of previous Offsoon. It uses revolutionary technology to quickly clean the endface of the female connectors to ensure low insert loss and high return loss in coupling. Especially suitable for factories due to its high efficiency. 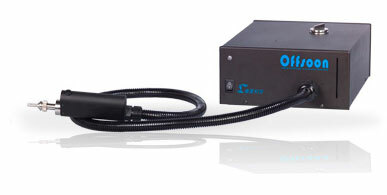 Offsoon uses liquid and gas to do the cleaning. Offsoon shoots clean liquid to dissolve oil and dirt and blow the end face with clean air stream to remove the liquid and make the endface clean. The whole process just need 1 second. Offsoon comes along with SC and LC type adaptors and fulfill almost every customer is need in cleaning connectors. Offsoon has many improvements compare to previous offsoon. Higher Cleaning Efficiency: Up to 95% cleaning effectiveness. Better Cleaning Program: less cleaning time, from 1.2s to 1s. Improved Gas Route: provide higher air pressure. 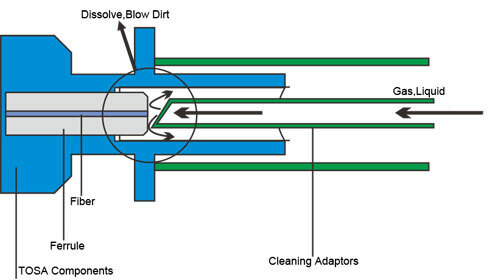 Improved Adaptors: better cleaning efficiency and product compatibility. Durable Components: seal rings with longer life term. Offsoon has 2 trigger method; handle swith and pedal swith. The pedal switch uses durable aircraft grade plug to connect with the machine. The SC and LC adptors can clean various products in high efficiency. The handle fits the palm perfectly reduce fatigue of the operators and increase efficiency. Liquid refill is very easy and convenient. It will not scratch the endface because the cleaning method is noncontact, the waste cleaning liquid is aspirated back to the machine will not harm the operators and protects environment.